wrap up – Traveling Epic! In some ways, I have ultimately travelled less this year than in the last 3 years, but in other ways I really made it count when I was traveling… from visiting new countries to building new communities. This post is a cross post from my technical world and my travel world in a wrap up of my travel for the year. Taking someone who loves travel more than nearly anything and saying be very selective about where you go. You end up with some incredible trips. In my quest to combine my love for exploring the unknown and building and creating communities in places where they don’t exist has been an epic journey which inspired and kicked off my travel blog this year… http://travelingepic.com Can you believe I’ve posted over 30 travel posts since April 2012 when my travel blog launched? Here is a list of some of the Epic places along with the incredible new communities launched in this beautiful world of ours. 1. #STPSA Sharing the Point South America and Antarctica – HUGE Kudos to AvePoint and Dan Holme. Ricardo MVP from Costa Rica/Chile was our regional host. We spoke in Santiago Chile, Montevideo Uruguay, and Buenos Aires Argentina and even spoke to the Penguins. The first community gathering ever in Uruguay and the largest gatherings ever in Argentina. 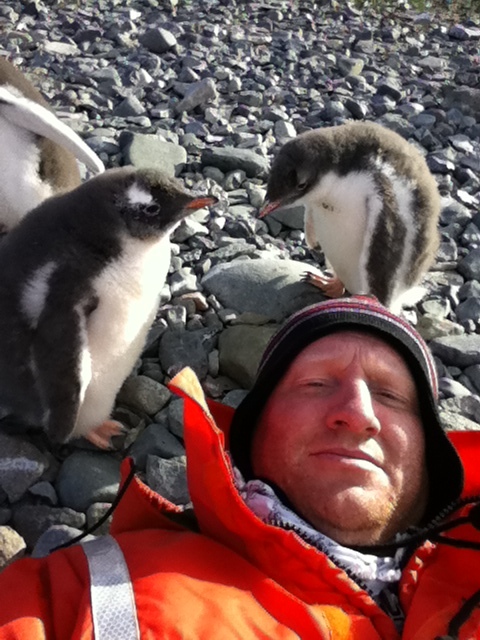 One baby penguin launched me into Youtube stardom with half a million views and video and personal mentions on Huffington Post, Discovery.com, ABC, CBS, FOX, and viewed on TV on FOXNews, and mentioned by friends on TV in Japan and Costa Rica and more. Dave Rubenstein was gratious enough to allow us to give the debrief of the Community Building Activities in South America at SPTechCon in SF following a Seattle/Redmond trip reconnecting with a lot of MS friends including night out with MVPs gathered for MVP Summit and flight with Ricardo and share some select photos and videos. 2. Microsoft Bulgaria #MSDAYS made the next community building trip happen. Radi and Tihomir were amazing hosts. Was great spending time with Radi (SharePoint MVP & MCM) and his team… and I *really* enjoyed meeting the SharePoint User Group at a traditional Bulgarian restaurant in Sofia Bulgaria. Amazing food. Amazing place. It was Darko who helped organize and with our help launch the Macedonia community. That was a big highlight of that trip. Their first and largest SharePoint gathering. Darko a SharePoint MVP in Skopia Macedonia took care of us, but even beyond that it was Betim and his group of SharePoint/SQL friends in Kosovo helped me understand there really are SharePoint people everywhere. Spent 3 of the 5 layover visits to Istanbul this year. Let me tell you, Istanbul is an AWESOME hub. Great place for a layover and the Turkish lounge is awesome, one of the best in the world. Anatolia and ultimately Goreme and Cappadocia are amazing. Highly recommended for your bucket list. UNESCO highlight. The underground cities with space for 5000 residences will blow your mind if the dozens of 4th century cave churches and cave monasteries don’t. Easily one of my favorites places in the world. 3. #STPAfrica Sharing the Point Africa – Africa is the place where there’s a lot of SharePoint Communities yet to be built. This would be my 6th Trip to Africa. I LOVE IT. It provided me the opportunity to reconnect with the very strong communities of Johannesburg and Capetown. I remember the first SharePoint Saturday in Johannesburg and Capetown from years ago. It’s amazing how strong the communities are with Veronique in Johannesburg. Alistair did an amazing job in Capetown. Was great to support both of their efforts on this trip. On our way over to Africa we stopped in Dubai on an 8 hour layover and helped get the community together. I’ve spent time in Dubai back in 2008 for the SharePoint Conference, and for TechEd Middle East in 2010. It’s a great venue and fascinating people gathered from around the region. This time it was just the locals and helping Mai Omar Desouki, Baraah M Omari, Usama, and Salman. Mai asked us a bunch of questions about getting the Dubai community started. After the midnight dinner and the dozen passionate SharePoint folks, I think it was enough to help her get it off the ground. With Eric Harlan’s help, Mai and others helped do their first SharePoint Saturday this past weekend and I’m happy to report the community is doing well. Another new community we launched was with the help of Jim Bob Howard. He has been pinging me for over a year trying to get a SharePoint Saturday organized in Kenya. What an event that was… over 100 people attended and with the help from locals we helped them get a regular user group organized. They’ve been able to meet since with great attendance. Hiking Mt Kilimanjaro in Tanzania was the peak of physical tests of my life. 61 Miles later I’d hiked the longest I’ve ever done. A side visit to Ethiopia to do some philanthropic work and vacation to visit the stone churches of Lalibela and excursion to visit the Ark of the Covenant in Axum, and great castles of Gondar. 4. Slovenia SharePoint Days 2012 in Kransjska Gora, Slovenia and SharePoint Adriatics in Zagreb Croatia both had very incredible events. The Slovenian event has been going on for years. This is my second annual, and I plan to go back next year. Branka and Urska and the whole crew at Kompas Xnet in Slovenia really know how to put together an event that makes you feel special. Toni and Nenad (MVPs in Croatia) did an incredible job. From there after a great stopover in Istanbul (site of a large SharePoint conference I spoke at in 2008) we traveled to Tbilisi, Georgia. This was SharePoint virgin territory. Microsoft themselves has only been in Georgia for 2 years with an office of 6 passionate folks. Georgia was originally planned to be a dinner. With Microsoft’s help, especially David from MS, we pulled off more than double the largest event they’ve ever had with over 50 people in attendance. We were feeling pretty good when we met our friends from Armenia. Manvel from Armenia organized a van from a relative to drive 5 hours one way to pick us up in Tbilisi. They even had to get Visas to travel to Georgia a place they hadn’t travelled prior. Huge sacrifice. When we arrived at the envisioning center in Yerevan we found they had 96 folks register and 125 people show up!!! That’s never happened in all of the SharePoint events I’ve ever attended. We’ve never had more folks show up than register. We usually assume 50% is pretty good for a free event. How about 125% on a Friday night at 7PM! We were very well received and had an incredible time with the community in our 3 hour event on a Friday night. Very humbling. I’ve seen this community getting organized. Both of these communities are packed with passionate people. You can read about these trips and more on http://travelingepic.com if you heard about something I haven’t blogged about, let me know what you want to hear more about!